I've been eating hummus for a long time. 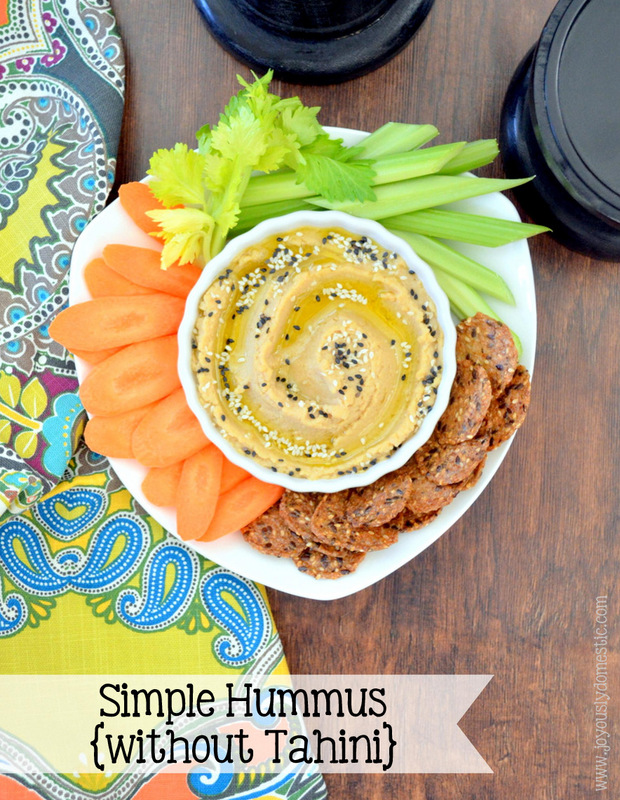 It's one of my favorite dips to have with veggies for a snack. However, one of the main ingredients in hummus - tahini (a sesame seed paste) - can be a little on the expensive side and hard to find for some. And, I never seem to use it fast enough when I do buy it since hummus is really the only recipe in which I use tahini. So, it often goes bad before it's used up. In this recipe, I start with toasted sesame seeds that I make into a paste myself. It eliminates the need for purchasing tahini. I pretty much always have the other main ingredients (chickpeas, olive oil, garlic and lemons) for hummus on hand. And, I buy sesame seeds in bulk at my local health food store very inexpensively. So, this is a fabulous recipe to have in my back pocket to whip up whenever the mood for hummus strikes or for when an occasion comes up last-minute that I need something snack-y to serve on the fly. You can embellish hummus any way that you like. It's so easily adaptable. Roasted red peppers are a great addition. I sometimes like chopped green olives sprinkled on top of my hummus for a briny kick. You can add in your choice of herbs or spices to change up the flavors, too. Some prefer garnishing hummus with whole, cooked chickpeas, olive oil and a sprinkling of paprika. And, hummus can be served with pita bread/chips, raw veggies or crackers. Yields roughly 2 1/2 cups. In blender or food processor, blend sesame seeds and 1/4 cup olive oil until a smooth, thick paste forms. Add in garlic cloves and pulse until evenly chopped and incorporated. Add in chickpeas, lemon juice and salt. Pulse until mixture is smooth or until desired consistency is reached. (Additional olive oil can be drizzled in as needed.) Taste and adjust salt as needed. Transfer hummus to serving bowl. Make a well in a circular pattern or as desired in hummus. Drizzle olive oil into grooves. Garnish with sesame seeds. Serve with raw vegetables, pita chips, pita bread or crackers. Please put a print button on your recipes!